For those looking for action hero Schwarzenegger, he isn’t anywhere to be found in this film but with a very talented cast members, the movie has some great moments. Arnold Schwarzenegger got his start in films as an action star. Movies like The Terminator, Predator, and Total Recall showed off his muscles and his ability to brandish a weapon but certainly didn't stretch his acting ability. After a stint as the Governor of California, he is once again back in films and taking on more demanding roles. One of his latest is Aftermath, a drama based on real life events. Roman (Schwarzenegger), a construction foreman, is eagerly awaiting the return of his wife and pregnant daughter. He has decked out the house as a welcome for their return and bought flowers to greet them with at the airport. However, when he looks for their arrival time he told to head to the ticketing counter where he is then shuffled to a back room office not knowing what is going on. Jake (Scoot McNairy; 12 Years a Slave) is an air traffic controller working the nightshift. When the maintenance crew takes down his main radar he is forced to use the backup and meanwhile must hop on and off the phone to another airport to assist in landing a plane. Distracted and off his headset he does not hear the two planes request a change in altitude at the same time resulting in a devastating crash that kills everyone on board, including Roman's wife, daughter and unborn grandchild. Despondent, Roman tracks Jake (in a new city with a new name and job) and stabs him to death in front of his wife and child. The plot takes the audience along on the parallel journey these individuals take after the crash. Both men seem to be spiraling into severe depression as their world is turned upside down and, at one point, both seem to contemplate suicide. Their despondency is palpable to anyone watching. Director Elliot Lester's (Blitz) effective use of backlighting, shadows and natural light gives Aftermath a gray, mysterious and gloomy overall feel, which is appropriate as the story trails two men whose lives are ruined by one fatal evening. He also utilized wide overhead shots numerous times throughout the film, giving the viewer the feeling of the vastness of the world below. McNairy is the stronger of the two men in the film. His sense of desperation is more acute and we watch his mood swing from confusion to sadness and hopelessness to complacency over the course of the movie. Meanwhile, Roman needs to show layers of emotion building up to the climatic stabbing but, unfortunately, Schwarzenegger just doesn't seem to have it in him. His dramatic performance falls flat and it isn't as easy to sympathize with him as it should be considering the circumstances. As previously mentioned, the color palate is muted and gray but the 1080p high definition picture quality is clear and adds a crispness to the cold, outdoor, winter scenes. The DTS-HD Master audio 5.1 is solid with the dialogue heard through the center channels and the effects (think airplanes flying overhead) using the surround sound nicely. Since there isn't much background ambient noise, nothing is explosively earthshattering in terms of sound effects. The Blu-ray only has two extras besides the trailer. They are an audio commentary with the director and producer and a seven-minute feature interviewing Director Elliot Lester and the Director of Photography Pieter Vermeer (Nightingale). With an interesting idea based on a true story, Aftermath had strong potential but didn't quiet live up to it. Schwarzenegger needed to bring even more emotionally than he did to make the audience understand his despair. For those looking for action hero Schwarzenegger, he isn't anywhere to be found in this film but with a very talented cast members, the movie has some great moments. 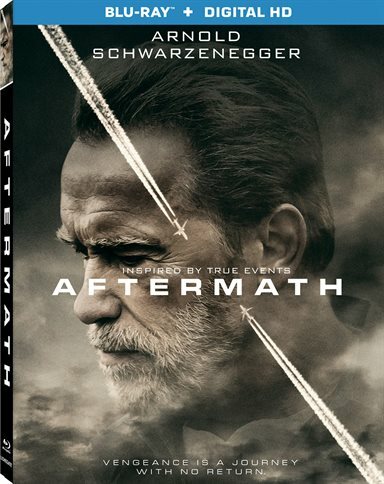 Download Aftermath from the iTunes Store in Digial HD. For more information about Aftermath visit the FlickDirect Movie Database.